EN GARDE! A FAPA PUBLICATION FRACTIONAL NUMBER XVII VII. Mustered with Malign Machination By AL (abysmal) ASHLEY of 643 South Bixel Street, Los Angeles 14, California SPECIAL PACIFICON COMBOZINE ISSUE. [[illustration text]]ASP[[end illustration text]] YE LYSTTE OF LARGESSE TO YOUR EVERLASTING DISMAY you are now viewing Page 1. ARCHAEOLOGICAL DABBLING by Al Ashley beings on Page 2. DONN BRAZIER brings a tale of negation starting on Page 4. RAY BRADBURY wrote years ago what appears on Page 6. THE COVER picture is by special arrangement, and suggests a good location for next year's Convention. Since the first Convention, the trend has been ever Westward. Why should we break with tradition now? Thesestencilsarebeingcutfourdaysbeforetheconventionohwhydidwewait?? INTRODUCING EN GARDE En Garde is published for the Fantasy Amateur Press Association (FAPA). It appears quarterly, and the first issue came out in the Spring of 1942. That first issue had the same number of pages as this one, but since then it has grown until it averages twenty or more pages. The last issue was the Fourth Anniversary Number and contained thirty-nine pages. The covers have a printed heading and an airbrushed picture in two or more colors. While the material will always be partly the efforts of the editor, many leading professional and fan names are represented each issue. The contents range from fan nonesense to more or less abtruse articles, and is at all times selected according to the passing whims of the editor, and the availability of material. 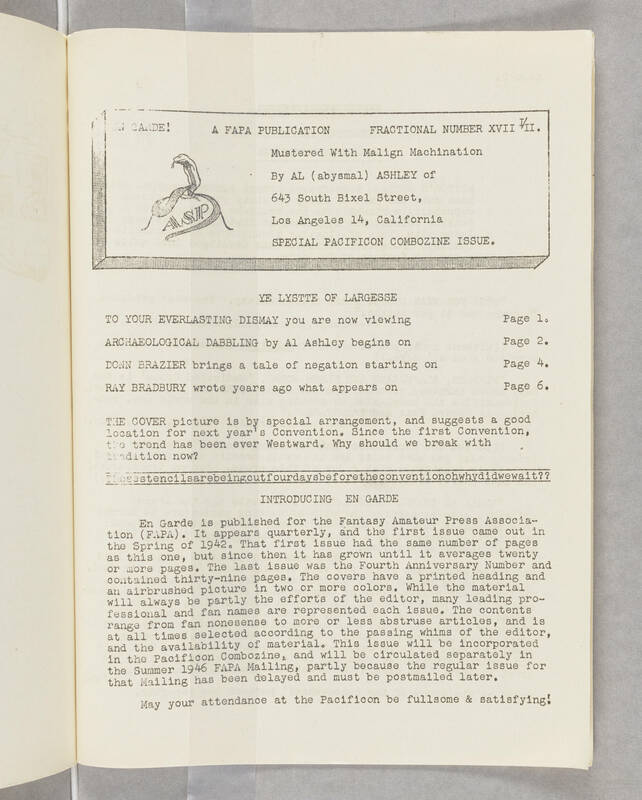 This issue will be incorporated in the Pacificon Combozine, and will be circulated separately in the Summer 1946 FAPA Mailing, partly because the regular issue for that Mailing has been delayed and must be post mailed later. May your attendance at the Pacificon be fullsome & satisfying!